MTV Base in a Twitter poll on Friday compared the singer with D’Banj. 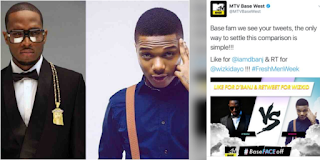 Wizkid, 26 replied the urban TV channel expressing his disappointment in the comparison. like for D’banj or retweet for Wizkid. However, Wizkid who never liked the comparison, told them he’s disappointed in them even after all King D’banj has done. MTV Base has since deleted the tweet.